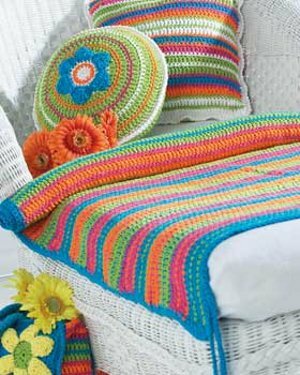 This Colorful Summer Beach Mat from Bernat Yarns is great to bring to the beach...or just to add some bright colors to your home! Perfect for those who are new to crochet, this crochet mat is easy to make and fun to display! Great for summer, spring, or anytime! MEASUREMENTS: Approx 28 x 60 ins [71 x 152 cm]. GAUGE: 14 sc and 16 rows = 4 ins [10 cm]. Note: When changing colors, work to last 2 loops on hook of last st, then draw new color through rem 2 loops and proceed. 1st row: (RS). 1 dc in 4th ch from hook (counts as 2 dc). 1 dc in each ch across. 97 sts. Join A. Turn. 2nd row:With A, ch 1. 1 sc in each dc across. Join MC. Turn. 3rd row:With MC, ch 3 (counts as dc). 1 dc in each sc across. Join A. Turn. 4th row: As 2nd row. Join B. Turn. 5th row: With B, as 3rd row. Join C. Turn. 6th row: With C, as 2nd row. Join B. Turn. 8th row: With C, as 2nd row. Join A. Turn. 9th row: With A, as 3rd row. Join MC. Turn. 10th row: With MC, as 2nd row. Join A. Turn. 11th row: As 9th row. 12th row: With MC, as 2nd row. Join C. Turn. 13th row: With C, as 3rd row. Join B. Turn. 14th row: With B, as 2nd row. Join C. Turn. 16th row: With B, as 2nd row. Join MC. Turn. 17th row: With MC, as 3rd row. Join A. Turn. Rep 2nd to 17th rows for Stripe Pat until work from beg measures approx 57½ ins [146 cm] ending on a 4th row of pat. Fasten off. Edging: 1st rnd: With RS facing, join MC with sl st to any corner of Mat and work 1 row of sc evenly around outer edge, working 3 sc in corners. Join with sl st to first sc. 2nd rnd: Ch 1. Working from left to right, instead of from right to left as usual, work 1 reverse sc in each sc around. Join with sl st to first sc. Ties: (make 2) With MC, make a chain 36 ins [91.5 cm] long. Turn ch sideways and sl st in each ‘bump’ at side of chain. Fasten off. Fold each tie in half and sew to short end of Mat 2½ ins [6 cm] in from side edges.